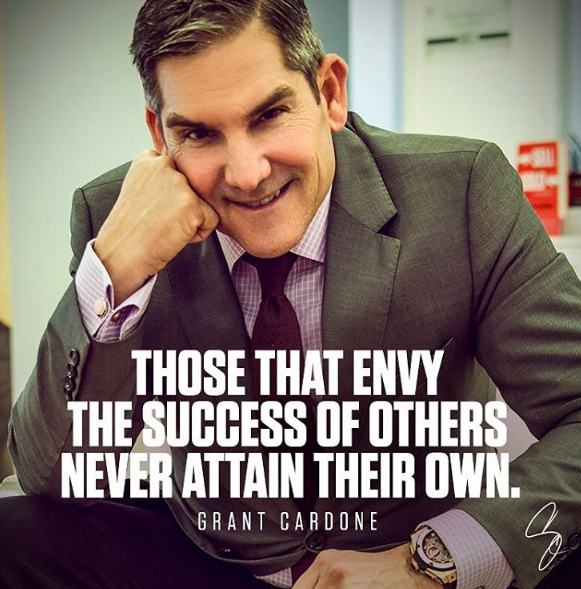 ​Grant Cardone quotes always fire me up. 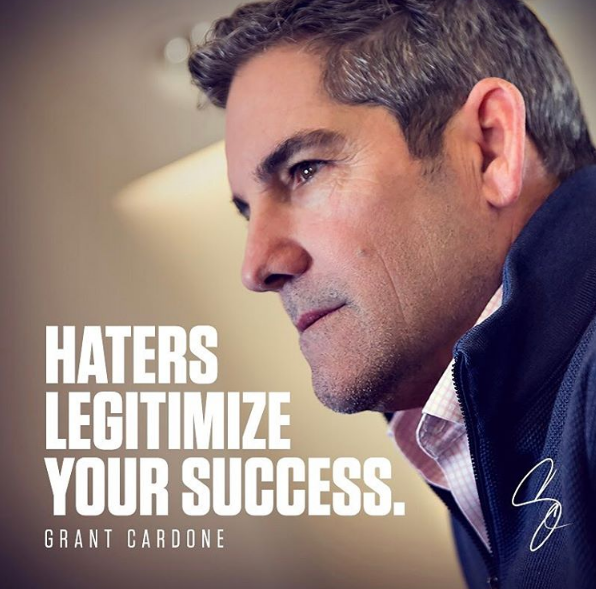 I’ve been following ﻿Grant Cardone﻿ for years now and he’s made an incredibly positive impact on my life. His “whatever it takes” attitude has inspired me time and time again to 10X my hustle. His books, audio programs and seminars provide people of all backgrounds with the tools necessary to build their path to financial freedom. I’m an especially big fan of Grant Cardone’s books – The 10X Rule is one of my favorite books of all time. 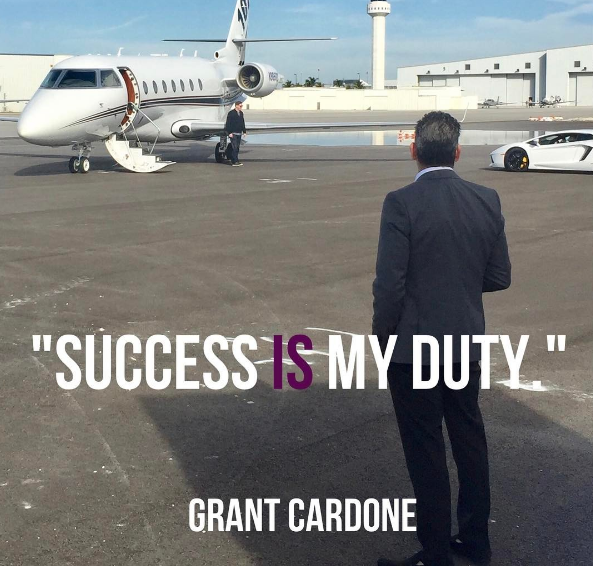 Here are some Grant Cardone quotes that’ll get you motivated to go and get it. 1. If the people around you are giving you advice to slow down or to take it easy, you are surrounded by the wrong people. 2. Never fear the haters. You can’t reach your potential without them. 3. The ambitious are criticized by those that have given up. 4. You will either get what you want or you will be used by others to get what they want. 5. Rich people don’t get rich by accident and poor people don’t stay poor by accident. Both take effort. Both are work. 6. Go the extra mile. There’s no one on it. 7. You’ll never be admired without being criticized first. 8. The goal is not comfort, it is freedom. 9. Your greatness is limited only by the investments you make in yourself. 10. Small thinking has and always will be punished in one way or another. 11. Never lower your target; increase your actions. 12. Anyone that suggests to do less is either not a real friend or confused. 13. Everything in life is a sale and everything you want is a commission. 14. Spectators pay, players get paid. 15. Comfort makes more prisoners than all the jails combined. ​16. Don’t go to work to work, go to work to prosper. 18. The single biggest financial mistake I’ve made was not thinking big enough. I encourage you to go for more than a million. There is no shortage of money on this planet, only a shortage of people thinking big enough. 19. Be great because nothing else pays. 20. Do the things you don’t want to do, so that one day you can do the things that you want to do. 21. Approach every situation with a whatever-it-takes mindset. 22. No one’s going to come to your house and make your dreams come true. 23. You won’t get much done if you only grind on the days you feel good. 24. There is no way God put us here to be ordinary. 25. Knowledge speaks. Wisdom listens. Action wins. 26. You don’t get burnout – you lose purpose. You lose your meaning. When I’m tired, I look at my purpose. 27. If you know what day it is, you’re not busy enough. 28. Focus on creating and producing a future, not what happened yesterday. 29. Average is a failing formula. 30. Obscurity is a bigger problem than money. ​31. You can’t get anywhere flying under the radar. 32. Show up early. Treat people with respect. Perform at the highest levels. 33. Don’t watch the news. Make the news. 34. All of the excuses in the world won’t change one simple fact: that fear is a sign to do whatever it is that you fear and do it quickly. 35. Massive success is the best revenge. 36. The weak compete. The strong dominate. 37. Luck is just one of the byproducts of those who take the most action. 38. Do what you are scared to do and watch your confidence grow. 39. Never lower your price. Add value. 40. Never depend on one action. 41. You sleep like you’re rich. I’m up like I’m broke. 42. Unwillingness to do what no one else wants to do is why people lack money. 43. The ambitious are criticized by those that have given up. 44. Fast is the new big. 45. Perfection is basically a symptom of procrastination. ​46. Success is your duty, obligation and responsibility. 47. I don’t have time is the biggest lie you tell yourself. 48. Just because most don’t make it doesn’t mean that you can’t. 49. Money and power follow attention, so whoever can get the most attention is the person who takes the most action and sooner or later will get the most results. 50. One week they love me, next week they hate me. Both weeks I get paid. 51. What if the only thing standing in the way of your greatness was that you just had to go after everything obsessively, persistently, and as though your life depended on it? 52. Anything that you give only average amounts of attention to will start to subside and will eventually cease to exist. 53. Don’t be confused by what looks like luck to you. Lucky people don’t make successful people. People who completely commit themselves to success get lucky in life. 54. I suggest that you become obsessed about the things you want. Otherwise, you are going to spend a lifetime being obsessed with making up excuses as to why you didn’t get the life you wanted. 55. Never take the position that things just happen to you; rather, they happen because of something you did or did not do. 56. What’s the worst thing that can happen to you if you just totally go for it? 57. When people start limiting the amount of success they desire, I assure you they will limit what will be required of them in order to achieve success and will fail miserably at doing what it takes to keep it. 58. No one is going to save you. No one is going to take care of your family or your retirement. No one is going to make things work out for you. 59. One of the major differences between successful and unsuccessful people is that the former look for problems to resolve, whereas the latter make every attempt to avoid them. 60. Success tends to bless those who are committed to giving it the most attention. 61. Extremely successful people know that their efforts must continue in order for them to realize new achievements. Once the hunt for a desired object or goal is abandoned, the cycle of success comes to an end. 62. Never reduce a target. Instead, increase actions. 63. There are certain things in life that have limits, but you don’t unless you impose limits on yourself. 64. Treating success as an option is one of the major reasons why more people don’t create it for themselves. 65. Success is not something that happens to you; it’s something that happens because of you and because of the actions you take. 66. A little imagination combined with massive action goes a long way. 67. No economy, no matter how bad, can hold down a goal that is followed by enough action. 68. Millions wish for financial freedom, but only those that make it a priority have millions. To get rich you will have to make it a priority. 69. Make it a rule that you never use debt that won’t make you money. I borrowed money for a car only because I knew it could increase my income. 70. Be known for your work ethic, not the trinkets you buy. 71. Start following the money and it will force you to control revenue and see opportunities. 72. Money doesn’t know about clocks, schedules or holidays, and you shouldn’t either. Money loves people that have a great work ethic. 73. The person who willingly swings the bat has a better chance at success than the person who refuses to swing. 74. The economy you have is only limited by the amount of unreasonable action you take to create it. 75. I have met thousands of extremely successful people, none of whom ever claimed their success came easily to them.